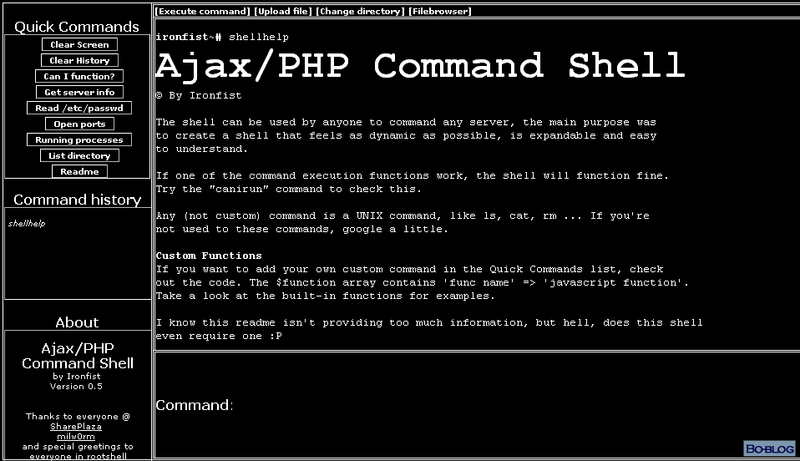 Ajax/Php Command Shell - 冷漠 ' Blog - Focus on Information Security ! This shouldn't be used for malicious purposes! => This is a very cool function, you can change the directory where you want to execute your commands, it will be stored in a session. |Some design changes, added titles to the tabs. |Directory listing when everything is disabled. |Can-I-run function, will control some server variables. v0.2 => added password protection, auto-clear (thanks to CHRiSNEW) of the command input line. <0.1 => core stuff created, white theme replaced by a black one, some simple functions added.